When Cliff Battley doesn’t run his busy practice as a Clinical Psychologist, he is the host of the ABC iView series ‘The Ex-Files’. 4DP helps Cliff with personal branding, PR, web design, social media marketing and Inbound Marketing. 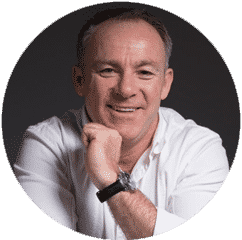 Not only does Cliff work with individuals, he is also a sought-after workshop facilitator, talented speaker, and one of the most popular health and fitness coaches on the Gold Coast! Cliff also hosts a series on ABC iView, ‘The Ex Files’. In this insightful program, Cliff has a novel way of helping his guests explore their relationship issues and reach deep personal insights which may prevent them from repeating negative patterns and behaviours in their lives and relationships. Each episode in this social experiment features a different guest and gives them an opportunity to consult those that know them best — Cliff is bringing back the Exes!! Cliff helps people to become the best possible version of themselves and reach their full potential. He shows people how to achieve long term positive change by looking at and improving the inner relationship we have with ourselves. Cliff equips and empowers parents with simple strategies to tackle and resolve everyday issues, which in turn encourages healthy social and emotional development and academic achievement in children. Cliff also helps both parents AND teachers with techniques which ‘bully-proof’ children. Cliff can teach everything required in order to live a balanced and healthy life. Cliff has a wealth of knowledge about, and a lifetime of experience teaching others about health, fitness, weight-loss and positive self-image. He believes in a balanced approach and in setting achievable targets. He has also developed a series of group workshops, as well as individual therapies to educate others in these areas. Regardless of the issue (e.g. conflict, commitment, intimacy, abuse and/or fear of abandonment), Cliff provides proven strategies to modify thoughts, feelings and behaviours. He helps clients develop and improve their communication style, self-image, choice in partner, historical and negative patterns and personal boundaries. 4DP helps with the PR and promotion of all his events. Currently, Cliff is on a mission to educate parents on how to boost kid’s self-esteem and how to react when encounter bullying in the classroom. His school tour covers several private and public high-schools on the Gold Coast. Cliff is a brilliant writer. But writing is a time-consuming task, so here at 4DP we want to make sure that the right people get to see Cliff’s content and also perform a defined set of activities. Through Inbound Marketing, Cliff can attract the right audience to his events, his website and to his social media channels. Cliff’s area of expertise is on relationship issues as well as on positive and effective parenting. 4DP makes sure the right people hear his messages at the right time in the right channel. We have built up his social media channels from the ground and are reaching 15k people on an average day without spending a fortune on Facebook Ads. When someone wants to work with Cliff, it is very likely he will visit his website. We made sure, his online presence reflects Cliff’s character but also gives the website visitor all necessary info to take the next steps, whether this will be downloading his ebook or attending his workshops. To find out more about Cliff and the services he offers, head to https://cliffbattley.com.au/ or check out his Facebook page, @CliffPositiveChange. And to watch his exciting ABC iView series, ‘The Ex Files’, head to https://iview.abc.net.au/show/ex-files .